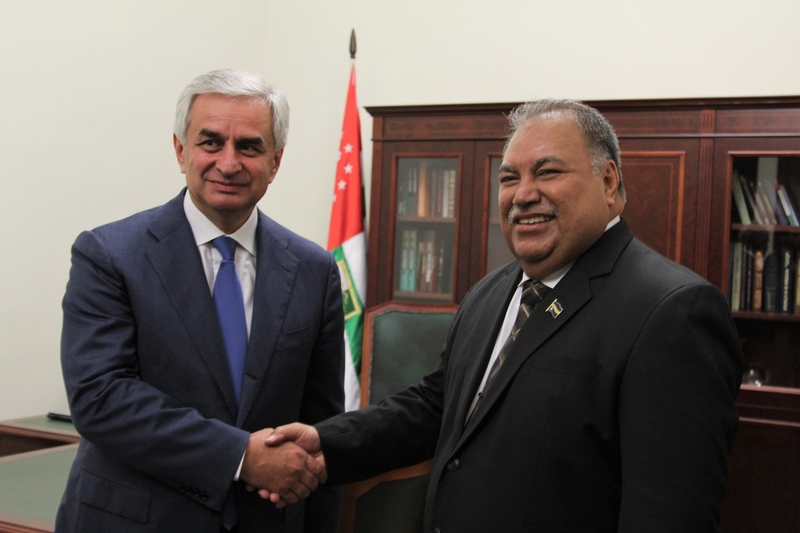 The president of the South Pacific island nation of Nauru visited Abkhazia, apparently the first non-Russian head of state to visit the mostly unrecogized republic. On November 12, the Abkhaz leadership rolled out the red carpet for Nauran President Baron Waka as both sides trumpeted the growing strength of their relations and expressed their desire for greater bilateral cooperation in the future. The meeting represented the third Nauran delegation to Abkhazia in slightly over a year. Content-wise, however, it’s not clear what the purpose of the visit was, and fulsome declarations of friendship seemed to be the main item on the agenda. That superficiality likely reflects the symbolic nature of Abkhaz-Nauran ties. After Russia went to war with Georgia over South Ossetia in 2008, Moscow began seeking countries to recognize the breakaway territories. One target was Nauru, an island known for its willingness to trade recognition for money. In 2009, Nauru reportedly accepted $50 million in humanitarian aid to establish diplomatic relations with Abkhazia and South Ossetia. The island’s foreign minister even visited the South Ossetian capital of Tskhinvali. But the most recent meeting took place against the backdrop of increasing American pressure on the few remaining supporters of Georgia’s breakaway regions. In May, United States President Donald Trump signed a spending bill denying aid to any governments that recognize or establish diplomatic ties with Abkhazia or South Ossetia. That poses a significant threat to Nauru, which depends on aid from international organizations that receive significant U.S. funding. Nauru, still, appears unwilling to forsake Abkhazia. During his visit to the Abkhaz capital of Sukhumi, Waka complained that his country had come under pressure from the U.S. and Georgia to abandon Abkhazia. “There were even attempts to bribe us, but we said we will not turn from this path. The situation resembled blackmail,” Waka said, according to the Apsny news agency. It’s not publicly known whether Abkhazia has received additional aid from Russia for its continued dedication to Abkhazia, but few would be shocked if that were the case. On the eve of its visit to Abkhazia, the Nauru delegation met with Russian Foreign Minister Sergei Lavrov in nearby Sochi. There, Waka hailed Nauru’s ties with Moscow and praised the Kremlin’s cooperation with South Pacific island states. For Sukhumi, the benefits of continued ties with Nauru are more obvious. Besides the island nation, only three sovereign states recognize Abkhazia as independent: Russia, Venezuela, and Nicaragua. While Russian President Vladimir Putin has made a number of visits to Sukhumi, no head of state from any other of Abkhazia's diplomatic partners has. There may also be a few less obvious benefits. During the Nauran visit, de facto President Raul Khajimba made a point to single out one member of the delegation, Marlene Moses, Nauru’s ambassador to the UN. He thanked her for “providing support” during UN General Assembly discussions on refugees. In recent years, Sukhumi has accepted several hundred Syrian refugees of Abkhaz descent — a decision that has sometimes proven a challenge for both Abkhazia and the refugees.